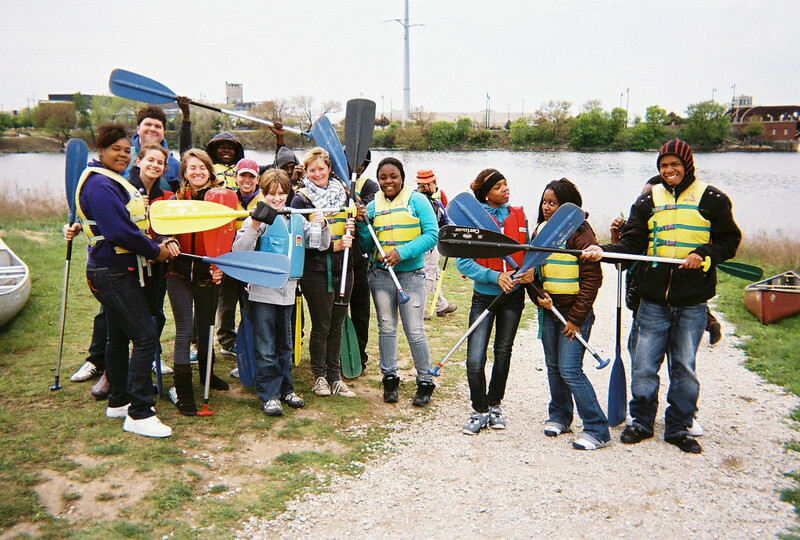 Led by Friends of the Chicago River, this outdoor adventure introduced RU undergrads and Cabrini-Green teens and young adults to river ecology, wastewater policy, Chicago history, and urban biodiversity — not to mention the no-less-important skills of teamwork and good paddling technique. Most of the day’s participants had limited to no canoeing experience prior to our adventure; but they learned quickly with the help of a pre-launch paddling lesson by our Friends of the Chicago River guides, and by the end of our 2.5 mile journey had proven themselves adept at handling a canoe on one of America’s most infamous urban waterways. Talk about baptism by fire . . . er, wastewater effluent! This industrialized and heavily polluted channel on Chicago’s South Side got its name years ago from the methane gas that bubbled up from the bacterial decomposition of organic waste on the creek’s bottom. Bubbly Creek was the notorious dumping ground for the Chicago Stockyards for decades. Things were so bad in 1909 that a chicken was photographed walking across the sludgy surface of the river. The South Fork’s revolting environmental history inspired me to take urban sustainability seminar students to the waterway as our capstone field trip back in May of 2009 — and I’ve been canoeing Bubbly Creek with my students ever since. 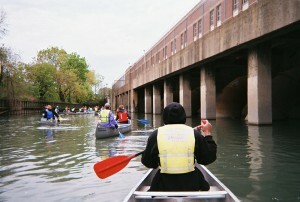 The mild spring weather, sluggish current, and lack of boat traffic made for exceptional paddling down the one-and-a-quarter-mile length of Bubbly Creek this past Sunday. Our view was one of arresting images and stark contrasts. 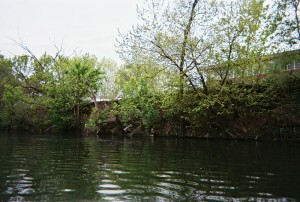 Along some stretches, vegetation reclaimed the industrial riverbank. Elsewhere, pipes stuck out from concrete or steel embankments, water from area street-level drains trickling from their openings — a hint of the deluge that would ensue were it to rain. We floated slowly and quietly under massive railroad and highway bridges, the dim roar of traffic far above us. 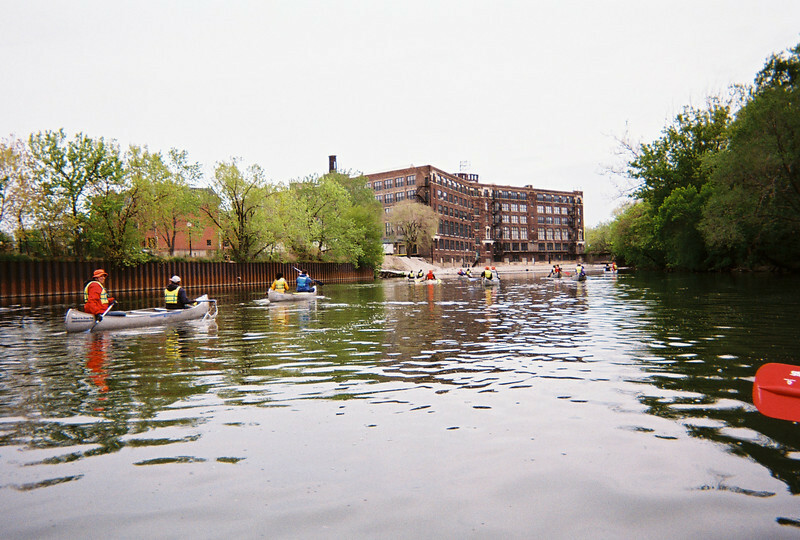 Visible evidence of pollution was everywhere — old plastic garbage bags hanging from trees; floating bottles and cans; the occasional used condom (nicknamed “Chicago River Whitefish” by jaded river veterans); and the infamous bubbles, still percolating up from the murky depths. At times the faint stench of sewage drifted over us. Yet, we also saw encountered wildlife, including Canada geese, Mallard ducks, a juvenile red-tailed hawk, and a green heron (one of the three heron species native to Illinois). Tree swallows swooped over the water, hunting for insects, and red-winged blackbirds and white-throated sparrows sang lustily from the brush riverbanks. Although we didn’t see any that day, beavers are known to be active along the creek, despite its persistent pollution. Such observations provided a dramatic ecology lesson: while Bubbly Creek is still in rough shape, it has come a long way from its earlier environmental desecration. 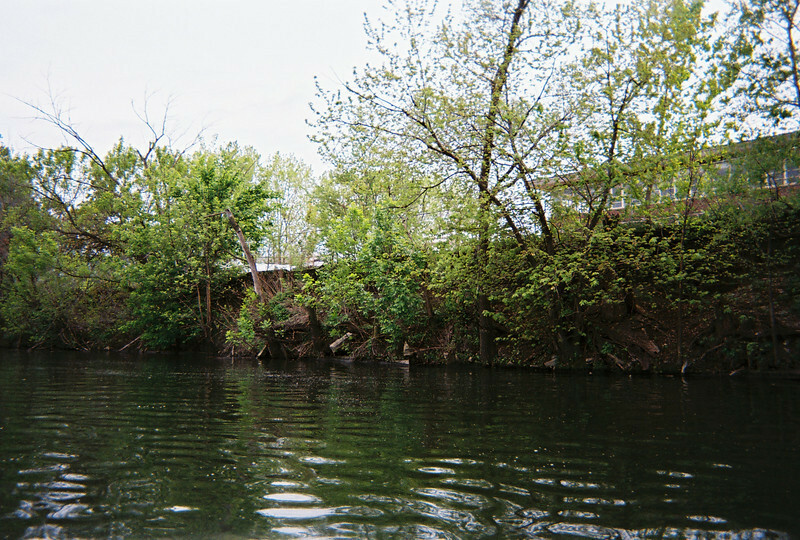 A significant moments of our trip occurred as we paddled southward along an imposing, rusted metal retaining wall on the east bank of the river; to the west was a more vegetated riparian zone that ended at a chain link fence. The view itself was unremarkable, save for the fact that we knew what was on the other side of that fence, mostly hidden from view on the high bank: the Iron Street Farm, one of Growing Power’s urban farming operations in Chicago that occupies several acres of former industrial land just west of Bubbly Creek at the intersection of Iron and 34th Streets. 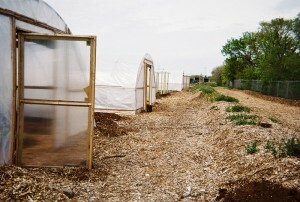 With a large building that has been adapted and re-purposed for integrated indoor urban agriculture (aquaponics and vermicomposting) and a bike repair facility, as well as extensive grounds for several hoop houses and even more composting bins, Iron Street Farm represents a sophisticated 21st-century post-industrial refashioning of a 19th century industrial landscape. And what of the connections between the water of the creek and the food growing enterprise along its west bank? 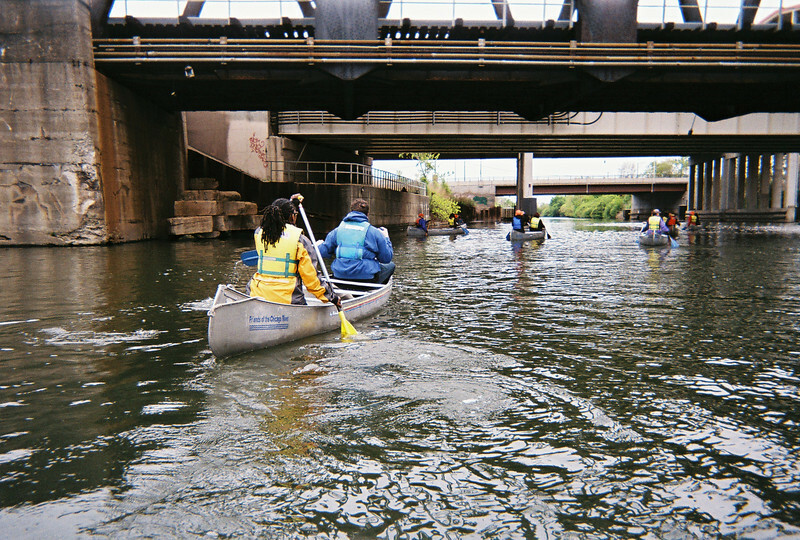 They are many and various, as we discussed while “rafting up” our canoes at the southern terminus of Bubbly Creek, where we contemplated the urban ecology of stormwater runoff and combined sewage overflows while floating in the shadow of the massive Racine Avenue Pumping Station. 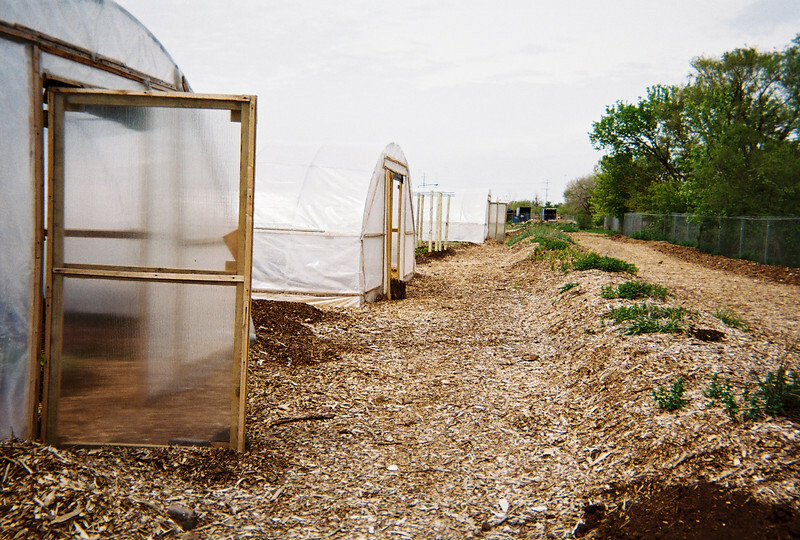 Every drop of water that falls on the compost-enriched soil of Iron Street Farm not only is utilized by edible plants in food production, but also is diverted from the sewer system of the city, thus reducing the total amount of surface run-off that results (in times of sufficient precipitation) in the release of untreated sewage into Bubbly Creek and the many other channels of the Chicago Area Waterway System. Beyond this systematic analysis, though, was a more emotional revelation about urban waterways that I felt may have occurred, tacitly but undeniably, amongst us on our trip — one that runs counter to the fears of the uninitiated that scary creatures lurk in the deeps, or that urban rivers are degraded beyond reclamation. 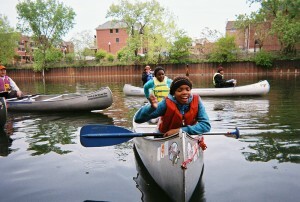 Given the chance to experience a river, up close and personal, people of all ages respond to its rough and imperfect charms. If we can learn to love and value the likes of Bubbly Creek — if we can see that a channelized, polluted, and long-neglected waterway has the potential to become, well, a river again — then just about anything’s possible. Want to see more? 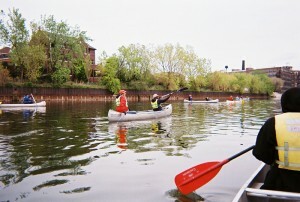 Check out these annotated slideshows of our RU-Growing Power canoe trip on Bubbly Creek as well as the Iron Street Farm. This entry was posted in Agriculture, Chicago, Classes, Field Trips, Food, Pollution, Rivers, Students, Urban ecology, Urban nature, Water. Bookmark the permalink. great pictures Mike. sorry I missed the trip. Makes me want to visit Iron Street Farm. What a cool trip, and a great story! Roosevelt – and its students — are lucky to have you! what a great trip and opportunity for your students and the rest of us to appreciate both the beauty and potential of bubbly creek. it nice to think that one of these days, in the not to distant future folks can paddle the creek and make a quick stop at the iron street market for fresh organic produce and free range chicken eggs.